The 1993 DCI World Championships were held in Jackson, Miss., amidst stifling heat and oppressive humidity. The most talk among fans was about Star of Indiana's controversial "Medea" show, with its extensive use of uncomfortable silences and arduous choreography. Star, in its last season in DCI competition, won 30 of 34 competitions, only losing four to the eventual World Champion Cadets of Bergen County. Blue Devils' color guard brought out gigantic paintbrushes for "A Don Ellis Portrait." The corps took 4th place over the Cavaliers, who had swept the Devils in all six shows during an early season California tour. Rounding out the top six corps, Madison Scouts played "Strawberry Soup." In 3rd place, 1.10 points under Star of Indiana and 1.10 points above the Blue Devils was Phantom Regiment. "The Modern Imagination" was inspired by the art of Henri Matisse, who famously captured the innocence of children's fascination with pure form and bright color. In particular, the visual stimulus came from Matisse's famed work, "Icarus," the most popular illustration in his book, "Jazz." The front ensemble percussion instruments were set back on the left side of the field, between the 30 and 40-yard lines; leaving the normal space for the pit around the 50-yard line to be used for a variety of brass, drum and color guard features. The first three works in the show came from the 1943 suite extracted from the 1941 ballet, "Estancia," by Alberto Ginastera, an Argentinian composer who studied under Aaron Copland. A New York dance company commissioned the ballet, but disbanded prior to the scheduled premiere. An estancia is a South American ranch in the southern pampas grasslands, which due to being a livestock estate, is worked by gauchos (similar to North American cowboys) on horseback. "The Landworkers (Los trabajadores agrícolas)" kicked off musically with repetitive drums and statements by the mellophones. Visually, some sudden pivoting turns by the baritones created the impression of cattle running from being lassoed. "The Wheat Dance (Danza del trigo)" came next, offering a lyrical interlude. "Danza Final (Malambo)" was the final selection from "Estancia," taking its title from a competitive macho dance among the gauchos. Starting with an extended drum feature, the piece then went into the frenetic melody first played by the corps in 1979. Near the end, the brass players crab stepped to the side during a hard-hitting repetitive chord and then added more flash with a quick 360-degree turn. A crowd favorite of Phantom Regiment is Dmitri Shostakovich's relatively unknown "The Fire of Eternal Glory (Novorossiysk Chimes)." It is a 1960 piece written for the war memorial in the city of Novorossiysk, Russia's main port on the Black Sea, though Shostakovich originally wrote the melody in 1943 for a contest to select a new Soviet national anthem. 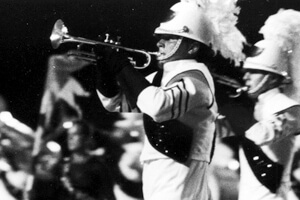 Since 1993, Phantom Regiment has often played the piece as an encore production. Discount DVD offer ends Monday, Feb. 25 at 8:30 a.m. ET.